FREE DASH CAM MOUNT Please Add both to Basket in Promotion Message to get it. Front Camera and Rear Camera: Excellent 1080P front camera with Novatek chipset,high sensor in both cameras capture super-sharp 1080P video,high definition image. Night Vision and IR Beads: The Car DVR equipped with IR Beads sensing night vision lights,WDR technology provides more dynamic range and picture details at night,insure you can record great when you drive in evening. 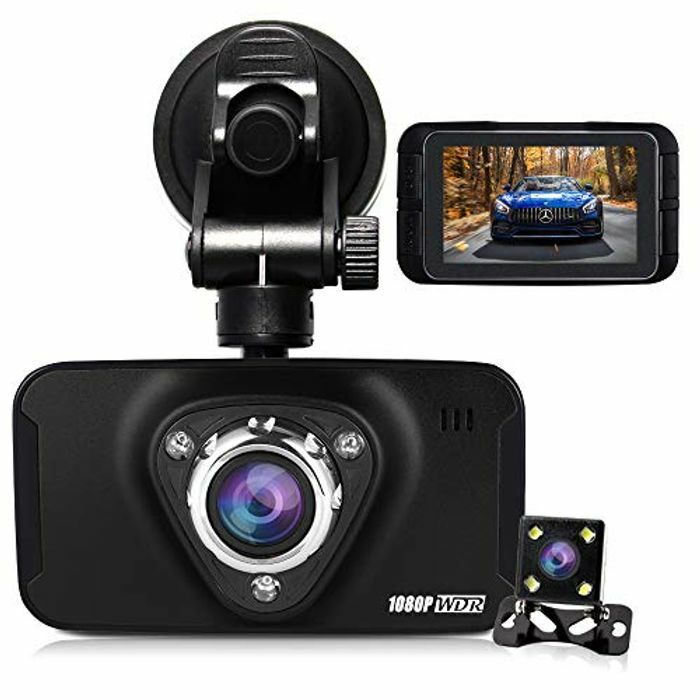 Powerful Functions: Cycle recording automatically overwrite oldest file with newest file; motion detection start auto recording when the dash cam detects motion front;G-sensor automatic video recording and video file locking when a collision or crash is detected. Its multifunctional features bring you a wonderful and safe driving experience. Why Choose the Camera: The recording of dash cam is timely, effective and safe, car accidents scene can be restored well and faking an accident to claim for compensation can be avoided. ad, help negate any false claims, give you peace of mind when driving, you deserved it.